The Richway Amethyst Biomat, available in the US and world-wide, is a high-tech Infrared Ray and Negative Ion treatment system that emits Far Infrared Rays and negative Ions. U.S F.D.A. Approved Class II Medical Device., Japan FDA Medical Device, Korea FDA Medical Device, CE, CVC, PSE, KMFDS, EAC, GMP, TUV, ISO 13485, ISO 9001, P.L.I. (F-2016-0219060). We hope that you will find our products of exceptional quality, and receive many health benefits as a result of using them. Richway and Fuji Bio Inc. continues to seek enhancing and innovative ways that allow you to live and look both healthy and happy. We create all of our products with cutting edge technology, engineering and methodology to meet your expectations of quality, performance and professional design. Spring Sale: It's time for our Spring Sale! Now until April 27th, 2019, big discounts on the following items: Biomat Aroma Stand, Pro size Biomat Black Canvas Travel case, Queen size Cotton Pad, Pro size Biomat Waterproof Cover, Rejuvena Premium, Alkalife 3000sl Water Filter. Buy One Alpha Max Serum 3.5 or Mega Bio Cleanse and Get One Free. 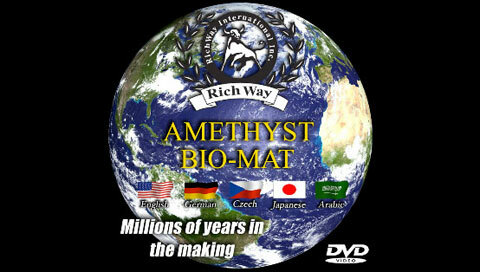 The Richway Amethyst Biomat is used by thousands of satisfied customers all over the world. Experience the soothing 3-part synergy of quantum energetics from Infrared Heat Rays, Negative Ion therapy and the healing properties of Amethyst. NEW Product: Richway has partnered with Cellreon, makers of the finest Korean luxury skincare and beauty products to create Alpha Max Serum 3.5. An intensive serum to combat dry skin, wrinkles, elasticity, loss of volume, and reduce the appearance of age spots and uneven skin tone due to aging. The Orgone Biomat encompasses a revolutionary concept designed to bring you an optimal night's sleep. The Orgone Biomat is made with the same cutting edge technology, methodology, and engineering as the original Biomat. We believe the Orgone Biomat will change the lives of many - one night at a time. The gentle warmth of the Richway Amethyst Biomat may give you an overall massaging effect, relaxing muscles and relieving back pain and arthritis pain. You may feel rejuvenated and renewed, restored in body and mind. Need the Richway Biomat shipped to USA? I am noticing huge changes. I also sleep better, and have more energy upon waking. The biomat is worth its weight in gold. My husband is also waking up refreshed and has more energy. We are very excited to offer to you at no charge a book titled "The Fourth Treatment for Medical Refugees". Written by Nobuhiro Yoshimizu M.D. Ph. D, Nakamachi Garden Clinic Director, this book discusses Thermo-therapy, the fourth treatment option. Download it here free. The Amethyst Biomat is a unique innovation in bio technology available in 5 different sizes containing 17 different layers. The Biomat is a high heat mattress pad. The pad does not get hot when it is turned on. The Biomat warms the inside of your body and the part of the pad making contact with your skin gets warm. An electric blanket or electric heating pad uses electric current which runs through it which is not healthy. When any part of the pad gets higher than the selected temperature, the sheet current is cut off by thermal sensors distributed throughout the pad. It comes with an external control box where the AC is converted to DC, and you can adjust the desired temperature of the pad. The Biomat controller has Electromagnetic Interception (EMI) which blocks the harmful EMF, as well as a Timer so you can set it to turn off in 2, 4, 8, or 12 hours settings. EMF (Electromagnetic Fields) is a term used to describe the invisible electric and magnetic fields radiating from all electrical appliances in the home, office or factory, in vehicles, and train lines. All Biomat products have been tested by TUV SUD for Electromagnetic Fields and were found to be in compliance with IEC 62233 (ed. 1) and EN 62233:2008. Enjoy the soothing Infrared Heat Rays and Negative Ion therapy recommended by Health Care professionals in the privacy of your home. The quantum energetics are profound and cumulative and benefit the body, mind and spirit.